Time taken = 7 hours 57 mins. Weather. Two feet of soft snow all the way round above above 750 metres, rain for first two hours and slight snow then clag. No sun until walking out. Harder snow on some of the plateau’s and walking on grass patches where able to minimise the effort required. I had been looking forward to this round for a while now and had been looking forward for some good weather to do it. The weather forecast for this weekend was good with lots of sunshine so it seemed like an ideal opportunity. So up at 4am and on our way at 5am. We made good headway and arrived at the car park at 0710. The car park was already busy and it was pouring with rain. I had expected the rain to be gone by now worse luck!! So on with our kit plus waterproofs and quick stop at the adequate toilets for a spot of relief before we headed on our way. There were quite a few deer in the adjacent field and I was surprised they didn’t bolt when the saw us but this is a busy area and they maybe tolerate us mere humans. So head off up the path and through the trees, passing a group of youngsters on the way and then continue on the path looking for a suitable point to head of up the corbett Cairn Canachcraig. The slope looked steep and it took a little bit of time trying to find a suitable start point before just deciding to climb up the verge and head on upwards. Now this slope is full of boulders and heather. But its not the type of “skip through the heather whilst the hills are alive with the sound of music” Oh no, this was gorse bush imitation heather tightly packed and about two feet high. Due to the snow over this winter the bushes are all lying down facing down the slope. Therefore you not only have to climb the slope you have to lift your legs high over this stuff like you were hurdling hahaha. Add to that the rain and further up, the snow patches, meant that this became a more difficult ascent than expected. We arrived at the summit an hour after leaving the car park so quite pleased with that. Now its easy enough to follow the path back down to the main land rover track crossing it onto the path heading up the side of Meikle Pap. The path here is reasonable underfoot and is easy to follow until about 700m when it began to fill with snow. Soon after we were walking in complete soft snow coverage which was making walking more difficult. At this point we noticed Ski tracks heading up the hillside. AT 850m we noticed a couple of walkers directing in front of us SW, climbing up the snow. We made a decision to head W for half a km towards the Bealach and then head SSW up the ridge. This ridge is a boulder field and again the snow made it difficult going. As we got to 1000m the snow was starting to harden and It was getting a bit slippy so the thought of donning crampons went through my mind, however I decided that whilst I could still get my feet into the snow we would persevere. We caught up with the skier at this point and with some relief shortly after we were on the spot height summit (1078m). The skier said he was not doing Lochnagar so we bid fairwell and continued on our journey, The rain was slight now and turning to snow briefly before stopping however after about 1km we entered almost white out conditions. Danny had to warn me because I was pretty near the edge of the corrie and with the corniced snow and clag it would have been easy to get into trouble. (I knew there was a reason for bringing him along hahaha). Shortly after the clag started to lift and we arrived at the summit of Lochnagar (Cac Carn Beag). We stopped for some pictures and refreshments but the wind was freezing and in a short space of time my fingers were frozen. So kit on and head back the way we came, moving fast to warm up. I say fast but the snow was making the going very tough. After about half a km we head SW which pretty much takes you directly to the next munro carn a choire Bhoidheach. Its a distance of about 3km. We tried to stick to the vegetation sticking through the snow but it wasn’t always possible and there were fields of strenght sapping soft snow to cross. We could see the skier up ahead as we climbed the slope up to the summit. Its now a walk, keeping on the higher ground, to Carn an t-Saigert Beag and Carn an t-Saigert Mor heading NW, SW,W and SW over a distance of about 3 km. There is a path on the map that takes a more direct route descending into the valley but you could not see any paths today due to the snow and that would involve a bigger climb to the summit. 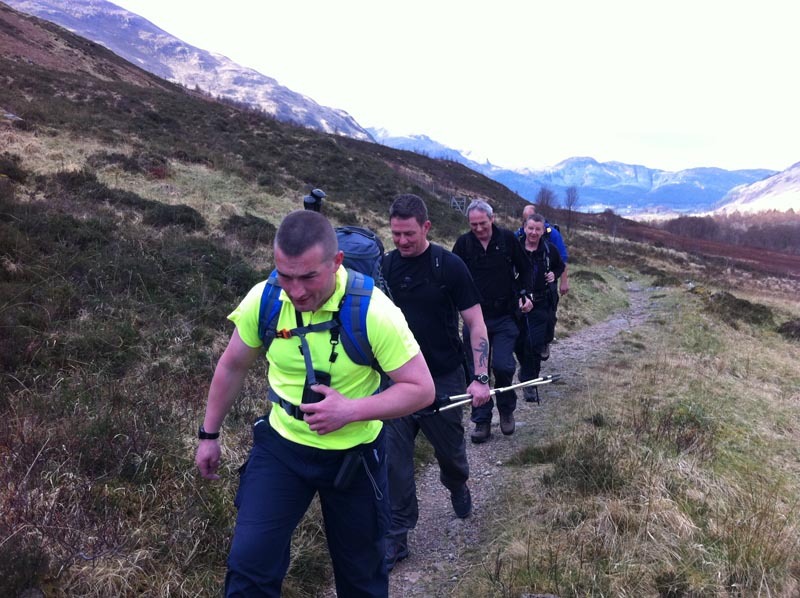 As we Climbed the latter munro we stopped and had a chat with three walkers. Its now a walk of approximately 5km SE to the summits of Carn Bannoch and Broad Cairn. 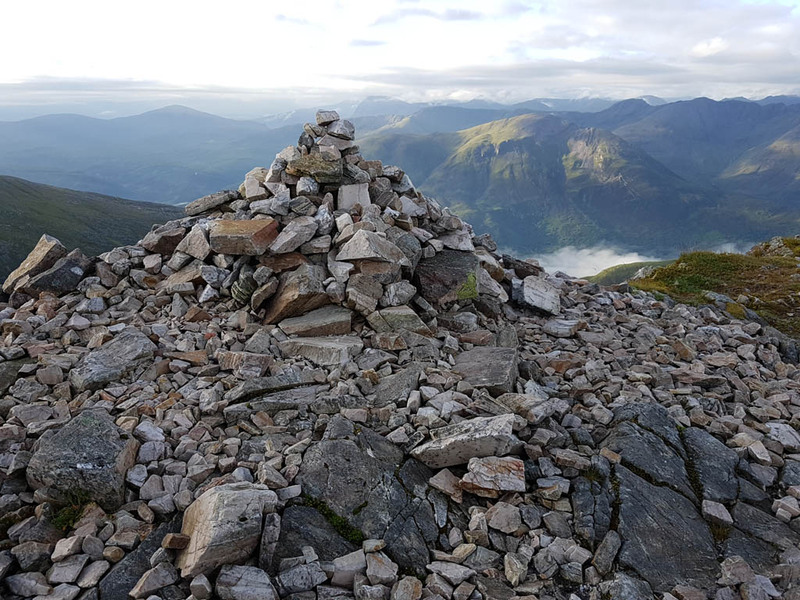 Both these summits are cairns perched on the top of huge boulders. We had a rest here and a quick chat with two other walkers. Thats all the hills completed and its now a matter of the long walk out to do. Its about 10km back to the car park with the majority of it on good tracks however 5km from the car park the track drops 200m sharply and this played havock on my knees. However after the drop its a nice flat fast walk to the finish. There were a lot more people on the lower track enjoying the nice weather hahaha. Actually it was a lot warmer and the sun was trying to break through.